Thought you all might be interested in the attached 19th century Central Pacific Railroad Freight Truck Survey. 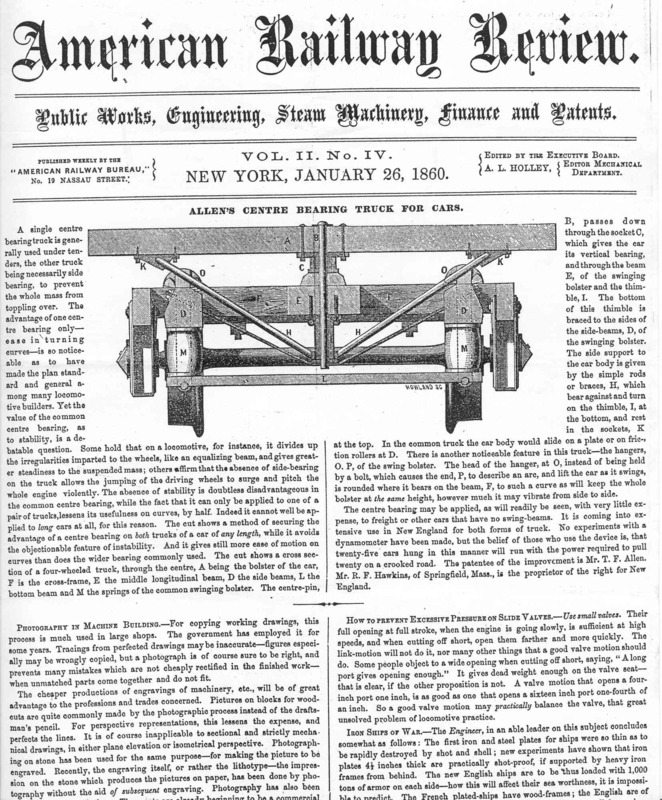 I had an article from American Railway Review [Janury 26, 1860] and it is about the Allen truck. The other photo is from the DSS&A Gondola at Mid Continent. The build date on the car is listed in company records as 1897. Late for this type of truck. A check of the car number in the equipment registers shows that a 34ft car was built in the mid 1880 with this number. The number stays active but the car grows to 36ft in 1897. We are assuming that all the old iron was reused to make a new car. I mention this to caution about drawing conclusions from builders photos. Were this car photographed in 1897 as new it may lead you to believe that the trucks were also new in 1897. 1897 IS late for a swing motion truck like on the DSS&A gon. Clearly they reused it. Similarly, the Virginia & Truckee rebuilt a number of flatcars in the 1890s using old parts. Also reused were old trucks of style 1 and 2 on my info sheet. On the first truck you don’t mention the trussed spring plank, or the middle nest of springs. Consider mentioning it is a rigid bolster design (since with the next truck this becomes an issue.) I don’t believe we have a name associated with this truck. On your second truck, I would lead off with the common names (California Truck, Allen Truck) I would set the patents for the 6 and 8 wheel designs apart (but include them) as these are passenger trucks, not freight trucks. I believe the 1890’s truck (at least in some versions) has a CS number. Much like the Thelsen it comes in different capacities (I believe the trucks under the SN flat are the 30 ton version) CSRM has plans for these trucks (lots of plans) Would this be called the Small Truck or Huntington Truck? I'd really love to have a traditional set of drawings for the first truck – side; end; top – in the fashion of historic drawings we have for the other trucks. Maybe we can pursuade Mike Collins to draw the truck up. Yes, the trussed spring plank and 3rd cluster of springs is a key element of the design – but either a drawing or a good photo is really needed to illustrate it. I think I took some good photos at Carson City. In note in 1884 or so the National Car Builder had drawings of a 6-wheel CP freight truck that they identfied as California truck. 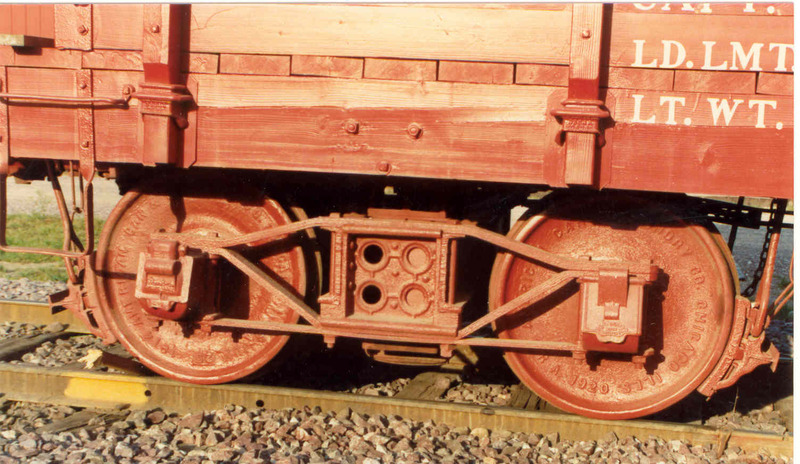 While most uses of the and 8 wheel versions were likely passenger, special heavy freight was not excluded. The affinity of Thielsen trucks and Hewitt journal boxes is certainly strong (they even share an office in Chicago for managing the patents), but there are definatey Thielsen trucks without Hewitt boxes (even on the C&C), and there are Hewitt boxes on non-Thielsen trucks. On the other hand, I didn't give it a separate number. I note by 1903 SP is using the heavy Thielsen trucks as caboose trucks, both on converted boxcars and on new built cabooses. No doubt they have plenty of them since they are either srapping or updating most freight cars that use the trucks. Yes, there is at least one CS number for the Small truck – I'll have to see if I can find it. Fortunately one pair of "heavy" Thielsen freight trucks survives under preserved ex-California Western caboose No.04 in the Roots of Motive Power collection at Willits. CWR reused ex-CP and ex-SP trucks as it built its own freight and logging flat cars, including either CWR caboose 04 or 05. We're still trying to pin down which of these two was the homebuilt – one, and a slightly different other short caboose, CWR 06, came from the SP via the 1924 EP&SW purchase and odd equipment spinoff that resulted from that purchase. In any case, we have a set of heavy Thielsens to measure if ever necessary.